We are a creative studio with graphic design, web development, print production, and mailing services in house. Grigg offers clients all the services of a big agency, without the big-agency price tag. 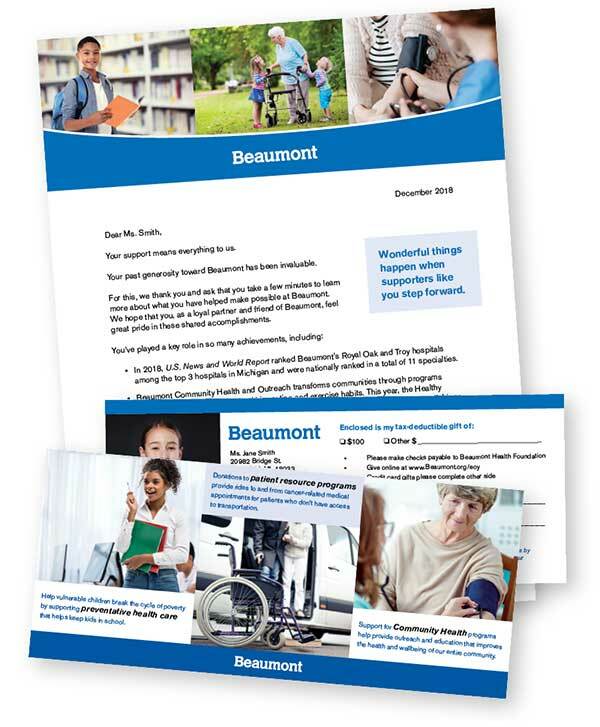 Beaumont Health Foundation has been a favorite partner of ours over the years. We’ve helped with many different design, print, and mailing services to help with their fundraising goals for many healthcare initiatives. This particular year-end appeal project incorporated the Grigg team to work together from start to finish produce a successful appeal. Our web team will help you develop and manage a user-focused website that will meet your specific goals. Our printing capabilities are broad: small stationery projects to annual reports, newsletters and calendars to one-of-a-kind specialized pieces. From museum galleries to donor recognition walls to senior residence communities, Grigg creates cost-effective and well-managed signage. From corporate to cutting-edge, we offer our clients vast creative resources and styles from an award-winning team of designers and creative collaborators. We offer complete mailing solutions—everything from cleaning targeted lists to high-speed addressing, personalizing, bar coding, inserting and tabbing. Grigg can partner with you to fulfill your project from beginning to end or anywhere in between! Grigg values the impact made by nonprofit organizations in the community. Our work helps to make communications of every kind impactful and effective. We support nonprofits through our paid services and contributions of time, talent and treasure. Here’s a spotlight on one of our favs. PVM is a faith-based, non-profit which offers a wide variety of residential living options and home and community services. PVM embraces and engages more than 5,000 seniors of all faiths and financial needs in and around 30 villages located thoughout the state.